Google EarthAmazon’s second headquarters, HQ2, could land in this area of Northern Virginia, adjacent to Dulles Airport. It’s estimated more than 70% of the world’s internet traffic flows through Data Center Alley. Amazon recently put the headquarters of its cloud business just 3 miles from the proposed HQ2 site. Amazon is also planning to build a 44-acre data-center campus nearby. Amazon has quietly been expanding its presence near the proposed site, which spans 26 acres of largely undeveloped land on the border of Loudoun and Fairfax counties. The company just put a new headquarters for its rapidly growing cloud service, Amazon Web Services, less than 3 miles from the site. And within a 10-minute drive is a sprawling 44-acre plot of land where Amazon is planning to build a massive 600,000-square-foot data-center campus. The site certainly makes logistical sense: It’s adjacent to Dulles International Airport and steps from an under-construction Metro station that will provide a straight shot to Washington, DC, and nearby suburbs. But most important – and perhaps not as well known – is that the site is at the center of what has been described as the “bull’s-eye of America’s internet,” also known as Data Center Alley, through which much of the world’s internet traffic flows daily. Amazon Web Services is powered by a physical network of data centres, or buildings that house servers and other IT equipment, around the world. 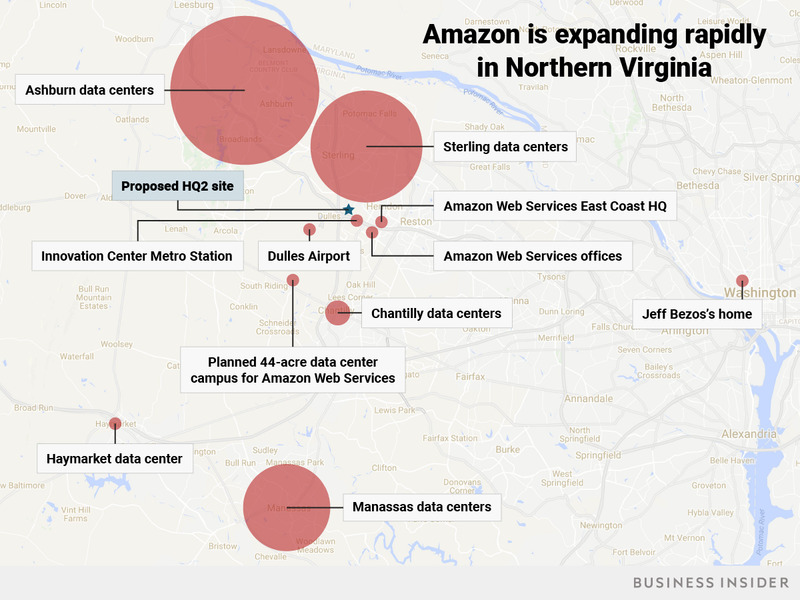 The heart of that network lies in an area of Northern Virginia that has become known as Data Center Alley for its high concentration of data centres belonging to Amazon, Google, Microsoft, Oracle, and others. Near the center of this bull’s-eye is the proposed HQ2 site. Amazon has roughly 30 data centres within a 15-minute drive of the site, in cities including Ashburn, Sterling, Chantilly, Manassas, and Haymarket. And it’s rapidly building even more. One of Amazon’s latest proposals is a data-center campus on 44 acres of undeveloped land a couple of miles south of the proposed HQ2 site. By building HQ2 in this area, Amazon could tap into its data-center network, bringing more efficiency and reliability to the internet connection at its headquarters. Another advantage of this fibre-optic paradise? The cost of power is cheap – and Amazon will need a lot of power for a campus expected to span millions of square feet. “Compared to the rest of the Mid-Atlantic region, commercial electricity rates in the Northern Virginia market are among the lowest,” according to the cloud-consulting firm DatacenterHawk. 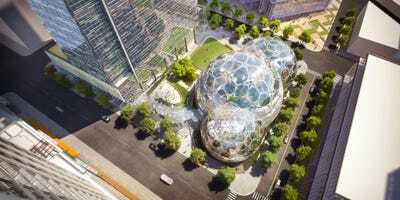 In addition to building data centres, Amazon is also moving corporate offices to the area. It recently selected a spot in Herndon, just 3 miles from the proposed HQ2 site, for its new Amazon Web Services headquarters. Amazon did not immediately respond to Business Insider’s request for comment on this story. Virginia’s Fairfax and Loudoun counties worked with developers to propose the HQ2 site, which houses a few buildings belonging to the nonprofit Center for Innovative Technology. 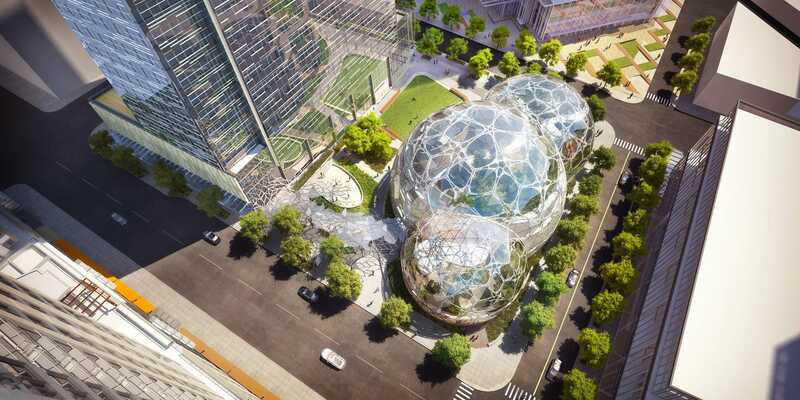 But aside from the center’s buildings, the 26-acre site is undeveloped, meaning Amazon would have a blank canvas – something few other urban areas can offer – for the eye-popping 8 million square feet of office space that it has said it needs for its second headquarters. Adjacent to the site is a giant rock quarry that, conveniently for Amazon, is being developed into a 5.5 million-square-foot mixed-use project called The Hub, which is expected to house 3.5 million square feet of office space, 400,000 square feet of retail space, 1,265 residential units, and 350 hotel rooms. The developers behind The Hub – a collaboration between Open Realty Advisors and Rebees called Open-Rebees – were involved in the HQ2 bid. Construction on it hasn’t yet started, so it’s likely that Amazon would have some say in the building plans if it chooses to put its headquarters there. Mark Masinter, the managing director of Open Realty, told the Washington Business Journal in a recent interview that he was hopeful The Hub would land HQ2 as a tenant. “Obviously, any developer on this continent that has the opportunity to land HQ2, any community and state that has the opportunity to land HQ2, they’re just incredibly fortunate,” Masinter said.